The poorest in society are being hit the hardest by changes to tax, social security and public spending reforms, and are set to lose 10% of their income. The Equality and Human Rights Commission reveals the effect of tax and welfare reforms since 2010 in a new report. EHRC has been looking into the effect of tax, welfare, social security and public spending has had on people since 2017. Their press release about the report is pasted below. The poorest in society are being hit the hardest by changes to tax, social security and public spending reforms, and are set to lose 10% of their income, our new report has revealed. Ahead of next week’s budget, the Commission has published its independent report on the impact that changes to all tax, social security and public spending reforms from 2010 to 2017 will have on people by 2022. Whilst the poorest are set to lose nearly 10% of their incomes, the richest will lose barely 1%. David Isaac, the Chair of the Commission, which is responsible for making recommendations to government on the compatibility of policy and legislation with equality and human rights standards, warned of a ‘bleak future’. “The Government can’t claim to be working for everyone if its policies actually make the most disadvantaged people in society financially worse off. We have encouraged the Government to carry out this work for some time, but sadly they have refused. We have shown that it is possible to carry out cumulative impact assessments and we call on them to do this ahead of the 2018 budget. The assessment undertaken by the Commission considered changes to income tax, national insurance contributions, indirect taxes (VAT and excise duties), means-tested and non-means-tested social security benefits, tax credits, universal credit, national minimal wage and national living wage. 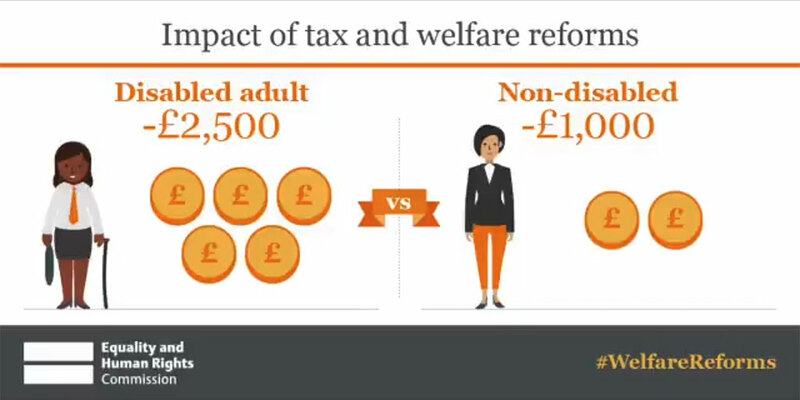 Read the interim report on the impact of tax and welfare reforms between 2010 and 2017.